There are two types of zoom capability offered by digital cameras. The first is digital zoom and is something you need to be aware of so that you are never tempted to use it! Digital zoom is simply the internal software of your device taking the image after it has been captured on the sensor and expanding it. This invariably leads to a dramatic loss of quality because all the camera is really doing is taking the same picture at the same resolution and digitally blowing it up. The idea that a consumer level camera with an ordinary lens and sensor could somehow have a zoom capability of 200X is utter rubbish! The second type of zoom is called optical zoom and the zooming effect is achieved by the lenses within the camera body or attachable lens assembly being adjusted. The only way to achieve any kind of zoom without degrading the image is to either use your feet and move closer or use the lens to optically move closer. The real question is whether you actually need zoom at all! Shooting in high definition at a high zoom rate means that you will absolutely need to use a tripod otherwise the shake in the shot will be unbearable to watch. For a professional the zoom is going to be achieved by adding a specific telephoto lens and he know he needs a tripod. For anything below that a little zoom may come in handy but it must be optical, not digital. The question of low-light performance is an important one and for any prospective camera buyer at any level, needs to be investigated very carefully. What most people don’t realize is that when we speak of low light we are talking about approximately the amount of available light that you would get in an average living room with the lights on at night. The average well lit office, all white and fluorescent sits just barely above the threshold of low light. For the average person shooting home videos, family events, parties and just about anything indoors you are always shooting in what is described as low light. There are a number of factors that can affect a camera’s ability to perform well in low light. The result of poor low light footage will be images that are grainy, lacking in definition, out of focus because the auto focus is having difficulty, poor color reproduction and a number of other things. In a professional or semi-professional camera, low light can be compensated for by opening up the aperture (wideness) of the lens, adjusting the shutter speed and adding more light externally with a lighting rig. For the home movie maker relying basically on auto settings, the key here is what we previously discussed in the section on sensor size and pixel size. As a general rule, the bigger the sensor and the bigger the pixels on that sensor are, the better the camera’s performance in low light will be. Either way when checking reviews on any camera, the section regarding low light performance is an essential one to cover regardless of your level of expertise. The lenses on cameras come in two varieties, fixed or interchangeable. A fixed lens camera will offer much less control over the manual settings and zoom but remember this is only a negative if you need those things. For many people a camera with a fixed lens may be enough for their purposes. Interchangeable lenses can attach and be detached from the main body of the camera generally by just screwing them on and off. You would think that somewhere in the history of cameras someone would have organized an industry wide set of specification for the size and system of attachment. Sadly no, there is still at least some variation. This variation is generally confined to the physical diameter of the hole in front of the camera where it attaches so take note of any size differences between various models and lenses to make sure you have compatibility. Obviously at the Smartphone, “point and shoot” end of the market the question of lenses is not one of great importance. These devices tend to have small, fixed, all-purpose lenses which attempt to capture the widest field of view possible and with everything in the picture in focus. Terms such as “depth of field” do not really apply here as there is no possibility of adjustment of the lens itself other than a small degree of optical zoom in some. The important point for anyone to note in the subject of lenses is the huge shift that has occurred in the sophistication of the cameras being made down into the consumer level. 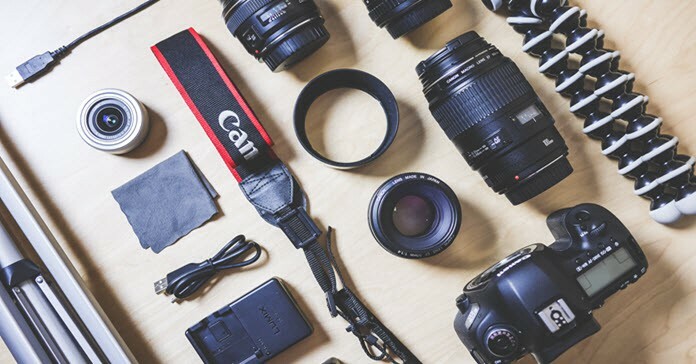 DSLRs, MILCs (Mirrorless Interchangeable Lens Cameras) and some dedicated camcorders even at the base level are now appearing with a capacity to accept lenses of differing sizes and capabilities. Interchangeable lenses can vastly increase your ability to make production choices through greater optical zoom, wider or narrower fields of view, lighting adjustments and depth of field. Possibly the most important of these is control over depth of field which in itself marks one of the major differences between an amateur video and a professional one. A shot with a shallow depth of field causes the subject to be in sharp focus while softening the rest of the shot. This allows the shooter to control the viewer’s attention by causing them to focus on the subject more closely. Different types of lenses are used to achieve different effects in the shooting of video so that a single camera can be used for a wider variety of shots and effects. Most interchangeable lens cameras that come with one lens fitted generally have a 35mm lens. This is a general all purpose lens that suits most situations. A Macro lens allows for super close-up shots to be captured such as flowers or tiny insects. A Wide angle lens causes the field of view available to the shooter to be widened beyond what would be normally seen through the viewfinder or screen. A Zoom lens allows the shooter to move in closer to the subject or move back as required. A Telephoto lens is designed to bring subjects closer.